For the edition of the Bible without chapters and verses, see The Books of the Bible. Different religious groups include different books in their biblical canons, in varying orders, and sometimes divide or combine books. The Jewish Tanakh (sometimes called the Hebrew Bible) contains 24 books divided into three parts: the five books of the Torah ("teaching"); the eight books of the Nevi'im ("prophets"); and the eleven books of Ketuvim ("writings"). It is composed mainly in Biblical Hebrew, and its Septuagint is the main textual source for the Christian Greek Old Testament. Christian Bibles range from the 73 books of the Catholic Church canon, the 66 books of the canon of some denominations or the 80 books of the canon of other denominations of the Protestant Church, to the 81 books of the Ethiopian Orthodox Tewahedo Church canon. The first part of Christian Bibles is the Greek Old Testament, which contains, at minimum, the above 24 books of the Tanakh but divided into 39 books and ordered differently. The second part is the Greek New Testament, containing 27 books; the four Canonical gospels, Acts of the Apostles, 21 Epistles or letters and the Book of Revelation. The Catholic Church and Eastern Christian churches hold that certain deuterocanonical books and passages are part of the Old Testament canon. The Eastern Orthodox, Oriental Orthodox, and Assyrian Christian churches may have minor differences in their lists of accepted books. The list given here for these churches is the most inclusive: if at least one Eastern church accepts the book it is included here. The King James Bible—which has been called "the most influential version of the most influential book in the world, in what is now its most influential language" and which in the United States is the most used translation, being still considered a standard among Protestant churches and being used liturgically in the Orthodox Church in America—contains 80 books: 39 in its Old Testament, 14 in its Apocrypha, and 27 in its New Testament. Rabbinic Judaism recognizes the 24 books of the Masoretic Text, commonly called the Tanakh or Hebrew Bible, as authoritative. There is no scholarly consensus as to when the Hebrew Bible canon was fixed: some scholars argue that it was fixed by the Hasmonean dynasty (140-40 BCE), while others argue it was not fixed until the second century CE or even later. Most conservative scholars believe that the Torah was canonized c. 400 BCE, the Prophets c. 200 BCE, and the Writings c. 100 CE, perhaps at a Council of Jamnia as concluded by Heinrich Graetz in 1871. The Council of Jamnia theory is increasingly rejected by most liberal scholars. Protestants and Catholics use the Masoretic Text of the Jewish Tanakh as the textual basis for their translations of the protocanonical books (those accepted as canonical by both Jews and all Christians), with various changes derived from a multiplicity of other ancient sources (such as the Septuagint, the Vulgate, the Dead Sea Scrolls, etc. ), while generally using the Septuagint and Vulgate, now supplemented by the ancient Hebrew and Aramaic manuscripts, as the textual basis for the deuterocanonical books. The Eastern Orthodox use the Septuagint (translated in the 3rd century BCE) as the textual basis for the entire Old Testament in both protocanonical and deuteroncanonical books—to use both in the Greek for liturgical purposes, and as the basis for translations into the vernacular. Most of the quotations (300 of 400) of the Old Testament in the New Testament, while differing more or less from the version presented by the Masoretic text, align with that of the Septuagint. These books, which were largely written during the intertestamental period, are called the Biblical apocrypha ("hidden things") by Protestants, the deuterocanon ("second canon") by Catholics, and the deuterocanon or anagignoskomena ("worthy of reading") by Orthodox. These are works recognized by the Roman Catholic, Eastern Orthodox, and Oriental Orthodox Churches as being part of scripture (and thus deuterocanonical rather than apocryphal), but Protestants do not recognize them as divinely inspired. Orthodox differentiate scriptural books by omitting these (and others) from corporate worship and from use as a sole basis for doctrine. Many recognize them as good, but not on the level of the other books of the Bible. Anglicanism considers the apocrypha worthy of being "read for example of life" but not to be used "to establish any doctrine." Luther made a parallel statement in calling them: "not considered equal to the Holy Scriptures, but...useful and good to read." The difference in canons derives from the difference in the Masoretic Text and the Septuagint. Books found in both the Hebrew and the Greek are accepted by all denominations, and by Jews, these are the protocanonical books. Catholics and Orthodox also accept those books present in manuscripts of the Septuagint, an ancient Greek translation of the Old Testament with great currency among the Jews of the ancient world, with the coda that Catholics consider 3 Esdras and 3 Maccabees apocryphal. Most quotations of the Old Testament in the New Testament, differing by varying degrees from the Masoretic Text, are taken from the Septuagint. Daniel was written several hundred years after the time of Ezra, and since that time several books of the Septuagint have been found in the original Hebrew, in the Dead Sea Scrolls, the Cairo Geniza, and at Masada, including a Hebrew text of Sirach (Qumran, Masada) and an Aramaic text of Tobit (Qumran); the additions to Esther and Daniel are also in their respective Semitic languages. The unanimous consensus of modern (and ancient) scholars consider several other books, including 1 Maccabees and Judith, to have been composed in Hebrew or Aramaic. Opinion is divided on the book of Baruch, while it is acknowledged that the Letter of Jeremiah, the Wisdom of Solomon, and 2 Maccabees are originally Greek compositions. The Ethiopian Tewahedo church accepts all of the deuterocanonical books of Catholicism and anagignoskomena of Eastern Orthodoxy except for the four Books of Maccabees. It accepts the 39 protocanonical books along with the following books, called the "narrow canon". The enumeration of books in the Ethiopic Bible varies greatly between different authorities and printings. The books of the Old Testament, showing their positions in both the Tanakh (Hebrew Bible, shown with their names in Hebrew) and Christian Bibles. 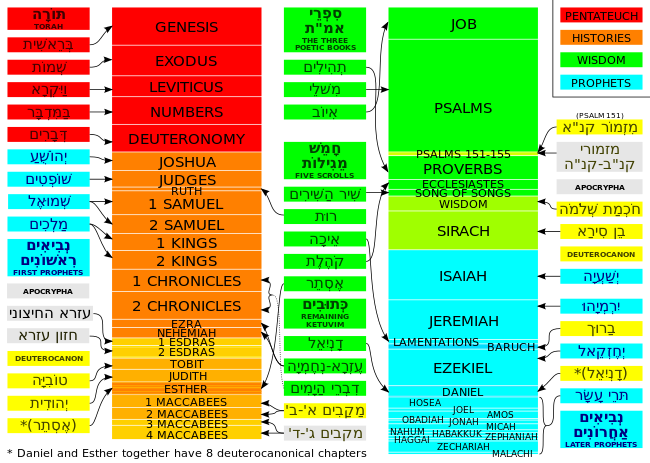 The Deuterocanon or Apocrypha are colored differently from the Protocanon (the Hebrew Bible books considered canonical by all). The table uses the spellings and names present in modern editions of the Bible, such as the New American Bible Revised Edition, Revised Standard Version and English Standard Version. The spelling and names in both the 1609–1610 Douay Old Testament (and in the 1582 Rheims New Testament) and the 1749 revision by Bishop Challoner (the edition currently in print used by many Catholics, and the source of traditional Catholic spellings in English) and in the Septuagint differ from those spellings and names used in modern editions that derive from the Hebrew Masoretic text. For the Orthodox canon, Septuagint titles are provided in parentheses when these differ from those editions. For the Catholic canon, the Douaic titles are provided in parentheses when these differ from those editions. Likewise, the King James Version references some of these books by the traditional spelling when referring to them in the New Testament, such as "Esaias" (for Isaiah). In the spirit of ecumenism more recent Catholic translations (e.g., the New American Bible, Jerusalem Bible, and ecumenical translations used by Catholics, such as the Revised Standard Version Catholic Edition) use the same "standardized" (King James Version) spellings and names as Protestant Bibles (e.g., 1 Chronicles, as opposed to the Douaic 1 Paralipomenon, 1-2 Samuel and 1-2 Kings, instead of 1-4 Kings) in those books universally considered canonical—the protocanonicals. The Talmud in Bava Batra 14b gives a different order for the books in Nevi'im and Ketuvim. This order is also quoted in Mishneh Torah Hilchot Sefer Torah 7:15. The order of the books of the Torah are universal through all denominations of Judaism and Christianity. The disputed books, included in one canon but not in others, are often called the Biblical apocrypha, a term that is sometimes used specifically to describe the books in the Catholic and Orthodox canons that are absent from the Jewish Masoretic Text and most modern Protestant Bibles. Catholics, following the Canon of Trent (1546), describe these books as deuterocanonical, while Greek Orthodox Christians, following the Synod of Jerusalem (1672), use the traditional name of anagignoskomena, meaning "that which is to be read." They are present in a few historic Protestant versions; the German Luther Bible included such books, as did the English 1611 King James Version. In general, among Christian denominations, the New Testament canon is an agreed-upon list of 27 books, although book order can vary. The book order is the same in the Greek Orthodox, Roman Catholic, and Protestant traditions. [N 1] The Slavonic, Armenian and Ethiopian traditions have different New Testament book orders. ^ a b c d e Four New Testament works were questioned or "spoken against" by Martin Luther, and he changed the order of his New Testament to reflect this, but he did not leave them out, nor has any Lutheran body since. Traditional German "Luther Bibles" are still printed with the New Testament in this changed "Luther Bible" order. ^ See Rabbinical translations of Matthew. Most modern scholars consider the Gospel of Matthew to have been composed in Koine Greek, see Language of the New Testament. According to tradition as expressed by Papias of Hierapolis, writing in the late first or early second centuries, the Gospel was originally composed in the "Hebrew dialect" (which at the time was largely the related Aramaic) and then translated into Greek (Eusebius, "Ecclesiastical History", 3.39.15-16; Epiphanius of Salamis, Panarion 30:3). According to Jerome, Hebrew manuscripts of Matthew were extant while he was translating the Vulgate: "Matthew ... composed a gospel of Christ at first published in Judea in Hebrew for the sake of those of the circumcision who believed, but this was afterwards translated into Greek though by what author is uncertain. The Hebrew itself has been preserved until the present day in the library at Caesarea, which Pamphilus so diligently gathered (St Jerome, "On Illustrious Men", Chapter 3). ^ a b c d e The Peshitta, the traditional Syriac Bible, excludes 2 Peter, 2–3 John, Jude, and Revelation, but Bibles of the modern Syriac Orthodox Church include later translations of those books. Still today the lectionary followed by the Syrian Orthodox Church, present lessons from only the twenty-two books of Peshitta. ^ Philip R. Davies in The Canon Debate, page 50: "With many other scholars, I conclude that the fixing of a canonical list was almost certainly the achievement of the Hasmonean dynasty." ^ a b McDonald & Sanders, The Canon Debate, 2002, page 5, cited are Neusner's Judaism and Christianity in the Age of Constantine, pages 128–145, and Midrash in Context: Exegesis in Formative Judaism, pages 1–22. ^ Ware, Timothy (1993). The Orthodox Church: New Edition. Penguin Books. p. 368. ISBN 978-0-14-014656-1. ^ "Introduction". Orthodox Study Bible (Annotated ed.). Nashville, TN, USA: Thomas Nelson. 2008. p. 1824. ISBN 978-0-7180-0359-3. ^ McLay, R. Timothy (2004). The Use of the Septuagint in New Testament Research. Wm. B. Eerdman's. p. 222. ISBN 978-0-8028-6091-0. ^ a b The foundational Thirty-Nine Articles of Anglicanism, in Article VI, asserts that these disputed books are not (to be) used "to establish any doctrine," but "read for example of life." Although the Biblical apocrypha are still used in Anglican Liturgy, ("Two of the hymns used in the American Prayer Book office of Morning Prayer, the Benedictus es and Benedicite, are taken from the Apocrypha. One of the offertory sentences in Holy Communion comes from an apocryphal book (Tob. 4: 8-9). Lessons from the Apocrypha are regularly appointed to read in the daily, Sunday, and special services of Morning and Evening Prayer. There are altogether 111 such lessons in the latest revised American Prayer Book Lectionary [The books used are: II Esdras, Tobit, Wisdom, Ecclesiasticus, Baruch, Three Holy Children, and I Maccabees.]" —The Apocrypha, Bridge of the Testaments Archived February 5, 2009, at the Wayback Machine), the modern trend has been to not even print the Old Testament apocrypha in editions of Anglican-used Bibles. ^ Samuel Fallows; et al., eds. (1910) . The Popular and Critical Bible Encyclopædia and Scriptural Dictionary, Fully Defining and Explaining All Religious Terms, Including Biographical, Geographical, Historical, Archæological and Doctrinal Themes. The Howard-Severance company. p. 521. ^ (Prayer of Azariah)- 200-0 BC, Bel, and Susanna are often enumerated as one book, "Additions to Daniel"
^ Including what is known as 5 Ezra (ch. 1-2) and 6 Ezra (ch. 15-16); only chapters 3-14 are denoted 4 Ezra proper in critical editions; the full book of 16 chapters is often printed as one work, "2 Esdras" or "4 Esdras", in popular editions. See Wikipedia's article on the naming conventions of all of the Books of Ezra (and Nehemiah). The naming conventions of the various deuterocanonical and apocryphal Books of Ezra/Esdras are different in every tradition (Greek Orthodox, Russian Orthodox, Roman Catholic, Protestant). Critical editions generally have settled on the Vulgate naming conventions, where Ezra and Nehemiah were 1 and 2 Esdras, Esdras A is 3 Esdras, and the Latin Apocalypse of Ezra is 4 Esdras (Charlesworth's Old Testament Pseudepigrapha). ^ "The Biblical Canon Of The Ethiopian Orthodox Church Today". Islamic-awareness.org. Retrieved 2012-08-14. ^ Generally due to derivation from transliterations of names used in the Latin Vulgate in the case of Catholicism, and from transliterations of the Greek Septuagint in the case of the Orthodox (as opposed to derivation of translations, instead of transliterations, of Hebrew titles) such Ecclesiasticus (DRC) instead of Sirach (LXX) or Ben Sira (Hebrew), Paralipomenon (Greek, meaning "things omitted") instead of Chronicles, Sophonias instead of Zephaniah, Noe instead of Noah, Henoch instead of Enoch, Messias instead of Messiah, Sion instead of Zion, etc. ^ The 24 books of the Hebrew Bible are the same as the 39 books of the Protestant Old Testament, only divided and ordered differently: the books of the Minor Prophets are in Christian Bibles twelve different books, and in Hebrew Bibles, one book called "The Twelve". Likewise, Christian Bibles divide the Books of Kingdoms into four books, either 1-2 Samuel and 1-2 Kings or 1-4 Kings: Jewish Bibles divide these into two books. The Jews likewise keep 1-2 Chronicles/Paralipomenon as one book. Ezra and Nehemiah are likewise combined in the Jewish Bible, as they are in many Orthodox Bibles, instead of divided into two books, as per the Catholic and Protestant tradition. ^ a b c d e f g h i j k This book is part of the Ketuvim, the third section of the Jewish canon. They have a different order in Jewish canon than in Christian canon. ^ a b c d The books of Samuel and Kings are often called First through Fourth Kings in the Catholic tradition, much like the Orthodox. ^ a b c d e f Names in parentheses are the Septuagint names and are often used by the Orthodox Christians. ^ a b Some Eastern Orthodox churches follow the Septuagint and the Hebrew bibles by considering the books of Ezra and Nehemiah as one book. ^ a b The Catholic and Orthodox Book of Esther includes 103 verses not in the Protestant Book of Esther. ^ a b The Latin Vulgate, Douay-Rheims, and Revised Standard Version Catholic Edition place First and Second Maccabees after Malachi; other Catholic translations place them after Esther. ^ In Greek Bibles, 4 Maccabees is found in the appendix. ^ Eastern Orthodox churches include Psalm 151 and the Prayer of Manasseh, not present in all canons. ^ a b In Catholic Bibles, Baruch includes a sixth chapter called the Letter of Jeremiah. Baruch is not in the Protestant Bible or the Tanakh. ^ Eastern Orthodox Bibles have the books of Baruch and the Letter of Jeremiah separate. ^ Hebrew (minority view); see Letter of Jeremiah for details. ^ a b In Catholic and Orthodox Bibles, Daniel includes three sections not included in Protestant Bibles. The Prayer of Azariah and Song of the Three Holy Children are included between Daniel 3:23-24. Susanna is included as Daniel 13. Bel and the Dragon is included as Daniel 14. These are not in the Protestant Old Testament. ^ Hieronymous (St Jerome), Eusebius Sophronius (1999). On Illustrious Men (Fathers of the Church). The Catholic University of America Press. p. 200. ISBN 978-0-8132-0100-9. ^ Contemporary scholars believe the Hebrews to have been written in Greek, though a minority believe it was originally written in Hebrew, then translated into Greek by Luke. See Wikipedia's New Testament article. Table of Tanakh Books – includes Latin, English, Hebrew and abbreviated names (from Tel Aviv University). Judaica Press Translation – Online Jewish translation of the books of the Bible. [permanent dead link] The Tanakh and Rashi's entire commentary. H. Schumacher, The Canon of the New Testament (London 1923), pp. 84–94. This page was last edited on 6 April 2019, at 06:26 (UTC).